Alpaca is 3 times warmer than wool and much finer. It does not contain natural grease like wool, therefore it is not necessary to clean it before handspinning it into yarn. Alpaca comes in a variety of 22+ colors, which allows handspinners to work with the natural color of the fiber instead of using dyes to introduce color into the yarn. Alpacas are from the camelid family. They look similar to Llamas but are smaller in size. There are 2 breeds of Alpacas: Huacaya and Suri. 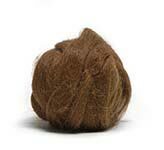 Suri - wool locks can be long and curly or straight fibers that are silky, very fine and very soft. There is a wide variety in the color of the fiber such as, white, fawn, reddish brown, gray, dark brown, and black. Suri Alpaca fiber is ideal for making soft loftier yarns for knitting. It can also be used for felting. Huacaya - (pronounced wuh-kai-ya) wool is denser than the Suri alpaca. It is soft and very easy to spin. This is the most common breed of alpaca found in the U.S. and Canada. It is not necessary to clean alpaca before spinning, because the fiber does not have grease in it. Some spinners find it easier to spin without washing it first. But if you have a really dirty fleece and want to clean it, follow these steps. 1. Pick out all of the vegetable matter by hand. 2. Fill a sink or dishpan with lukewarm water and a mild detergent. 3. Gently press the fiber down into the water without agitating it. 4. Let the fiber soak for 10-15 minutes. 5. Gently lift the fiber out of the water and squeeze the excess water out with your hands. (Do not wring the water out). 6. Repeat steps 2 - 5 depending on how dirty the fiber is. 7. Spread the fiber onto a towel and roll it to absorb excess water. 8. Spread the fiber into the open air to dry. It is best to dry the fiber on a screen so that the air can circulate underneath. 9. Store the alpaca in a paper bag, cardboard box, or a plastic bag with holes in it. (Storing alpaca in a garbage or trash bag will cause moisture to build up inside the bag and the fiber will felt. Alpaca is mostly available as a combed top. You can also purchase raw alpaca from breeders and often at wool festivals. Alpaca can be handcarded into rolags. It is best to use handcarders with fine teeth. Handcarded alpaca will spin into a soft fluffy woollen yarn for knitting. Use a drumcarder with fine teeth to create large batts for spinning. Adding 20%-50% wool to alpaca gives the yarn more elasticity. Spinning a single of alpaca and one of wool then plying the two together makes a nice woollen yarn. Wool can also be added to alpaca using handcarders or a drumcarder. Blending 10%-30% mohair will make a lofty yarn and give it a fuzzy look. Silk lightly carded into the alpaca will add sparkle in your yarn. Angora rabbit wool with alpaca makes an absolute luxury yarn. It is extremely soft and very warm. You can also use a drumcarder or handcarders to create various shades of alpaca, such as blending black alpaca with white alpaca will produce gray. Plying two singles of contrasting colors will create a tweedy effect in your yarn. Alpaca spins into a dense yarn, and can be used for knitting, weaving, and felting projects. Alpaca is a good substitute fiber for people who are allergic to wool, because of it's softness. A small amount of wool can be added to give the yarn more elasticity. Baby garments made of alpaca are also popular. Alpaca is a very versatile fiber often used to knit apparel such as, dresses, blouses, skirts, jackets, pants, pants, scarves, ties. Miscellaneous items include: curtains, draperies, and upholstery. A 2 ply yarn of alpaca will make a good warp yarn for weaving when spun with a tight twist. It will also work well as a weft yarn to weave pillows, vests, scarves, and shawls. Felting with alpaca is more successful if there is wool added to it. The batts of fiber are made with a drumcarder. The felted pieces can be used to make hats and vests.